We relaxed in the Mere Poulard Hotel for a little while, and about 8:00 we decided to attempt an escape. Upon descending from our room, we discovered that the crowd was mysteriously gone. The main street was almost empty, as was the parapet. Even more importantly, the sun was out. The day so far had been completely overcast, which drives us photographers crazy. We had taken many, many pictures in the gray, shadow-less, poorly-lit day. Now the sun was out! We walked along the parapet, re-taking as many pictures as we could, quickly, because sundown was approaching. We wanted to walk around the island again to re-take more pictures, but the tide had come in, and the walk around the island was now impossible (at least without scuba gear). Finally, when we had exhausted all the picture-taking opportunities, we walked around looking for a particular place to eat which had been recommended by one of our guide books, and found a place which might, or might not, have been the right one. It didn't really matter, because Donnie had the best Moules et Frites (Mussels and French Fries) that she ever had. After dinner, we walked out to the causeway to try to get some night pictures of the island lit up, and then had a good night's sleep. We awoke to a bright, sunny day, and after the usual morning routine we checked out, taking a few final pictures of the mountain on the way to the car. We drove off the causeway, and continued a short way along the coast road to take some distance pictures and then turned inland. We were driving through farms and corn fields, and suddenly right in front of us was a windmill that was actually turning. 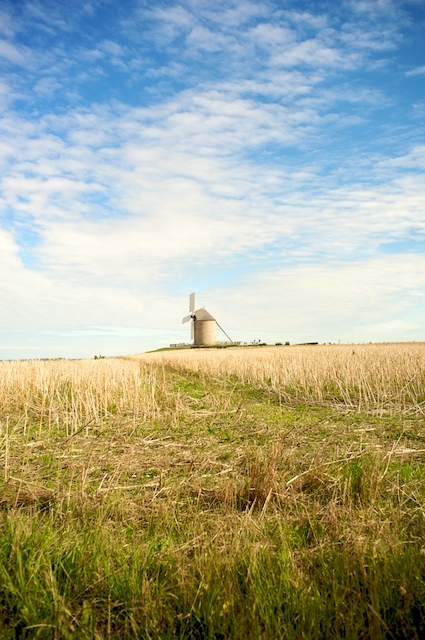 We turned down a little one-lane side road, and there it was, in the middle of some farms, a French windmill, with its sails out, turning. We took some pictures, and then went on our way. For the next part of our journey, we decided, was to visit some of the small towns in Brittany that were recommended by the guide books. Neither of us had any real idea what to expect. We drove to the small town of Dinan. Wow! 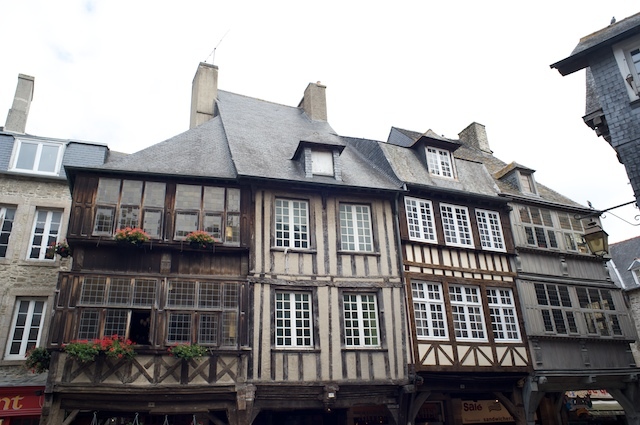 While walking through Dinan, we thought we heard medieval music. 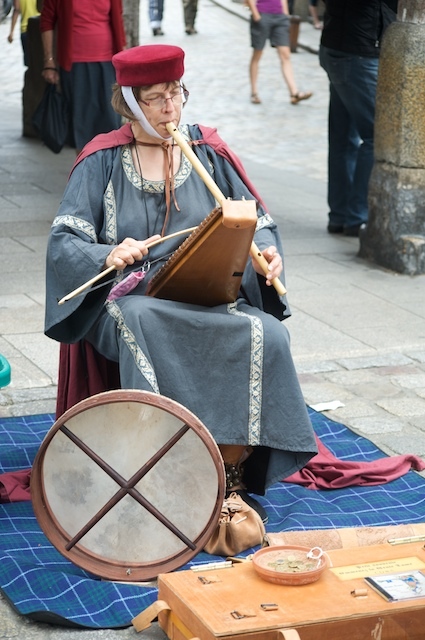 On moving closer to the sound, we came upon a woman seated on a corner, dressed in medieval costume, playing a wooden flute, a dulcimer, a drum, and some rattles, simultaneously! She played the flute with one hand, she bowed the dulcimer with the other, she had a foot pedal arrangement for the drum, and had rattles attached to her other foot. The music was beautiful. We listened for a while, and after each song she would take out another strange instrument and play it. She had a crowd around her. Many people were taking pictures (us included, of course). After some of her songs, she started to explain the history of the song (we think, she talked too fast for our high-school French to keep up). I think she is a Professor of Music History at some local college, who performs on the streets for the tourists as a hobby (or maybe to supplement her income). We left her a few Euros, and continued walking around Dinan. For lunch, we had some delicious crepes at an Artisanal creperie called the "Creperie du Roy". We think the owner was named Roy. 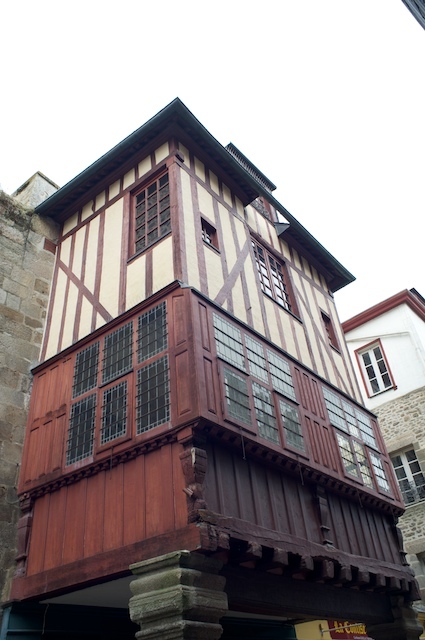 We then continued walking around Dinan, finding more old, beautiful buildings. 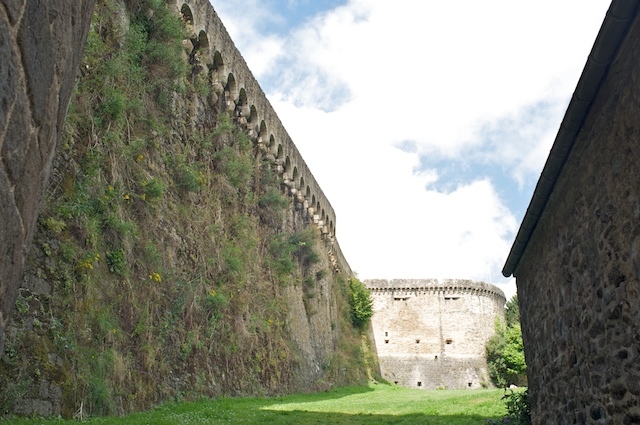 We started walked down a hill, and found the still-intact town wall, with turrets! Amazing. 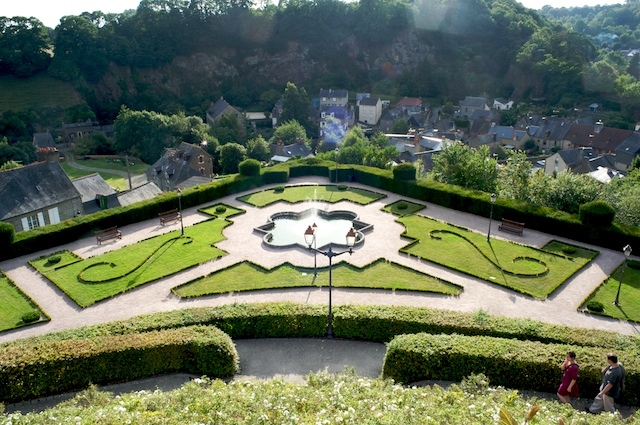 After Dinan, we drove to the town of Fougeres. 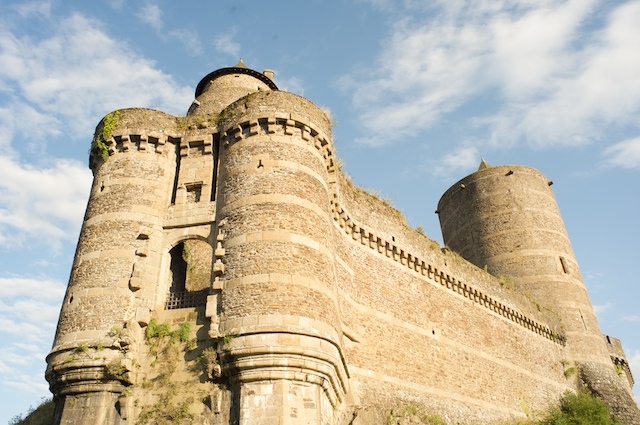 On the way into town we passed the main attraction of Fougeres: A huge castle-fortress, with over 13 massive towers and a huge wall. The castle is in a valley in the lower part of the town. We drove to the center of town, parked and went to the tourist information office, and asked about places to stay, since it was late afternoon. The nice young woman in the office showed us a booklet listing the local hotels, and she recommended two that were very close by. We walked to the first one, but were not very happy with it since the only rooms that they had available had no toilet in the room (you had to use one in the hall) and the room they showed us was very hot inside, and the door lock didn't work properly. We said no thank you, which was embarrassing since the desk clerk had been very kind and helpful, even holding a parking spot in front of the hotel for us by blocking it with some chairs! We walked a few blocks to the other hotel and it was quite different. The rooms were newly renovated, had toilets, an elevator, free wifi, etc. We gladly took the room., The only problem was parking. We had to leave the car in the public parking lot several blocks from the hotel. We booked the room, and then walked back to the car, and rolled our luggage several blocks through cobbled streets to the hotel. Eventually we settled in, and then decided to walk to the castle. The young woman in the tourist information office had given us a map and suggested that we walk along a certain route to visit the sights of the town, so we did. The tourist route took us through a lovely park, which contained a beautiful, formal garden, but going through the park involved taking long winding paths that went down at steep angles. 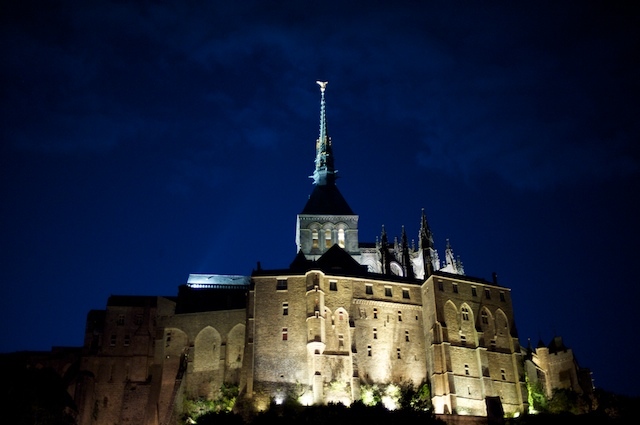 We walked around and down and down and down, and finally reached the impressive castle. The castle interior was closed because of the late hour, and so we walked around the outside, taking pictures. We then decided to walk back along the same road we had driven when entering the town. During this walk, we found ourselves in another small park, which didn't involve long winding paths, and which took us up to the higher part of town at an easier pace. I reached the top of the path ahead of Donnie, and told her to guess where we came out. We came out directly across the street from our hotel! The route suggested by the young woman in the tourist office was the long way around. (!!) By this time it was late, and the town was almost deserted, but there was a little pizza place across from the hotel which was still open, so we shared a huge very-fresh salad and a personal-sized pizza and retired for the night. The hotel we were staying at was part of a small French hotel chain or group called Citotel, which had a little guide book showing all their hotels in France. It said that any hotel would call another to book a room, so we asked the desk clerk to call ahead and reserve a room for us in the town of Vannes. We then trekked back to the public parking lot, slightly worried that something might have happened to the car during the night. Nothing had. The day was overcast, with some light drizzle, but we started on the next part of our tour of the small, medieval towns of Brittany. 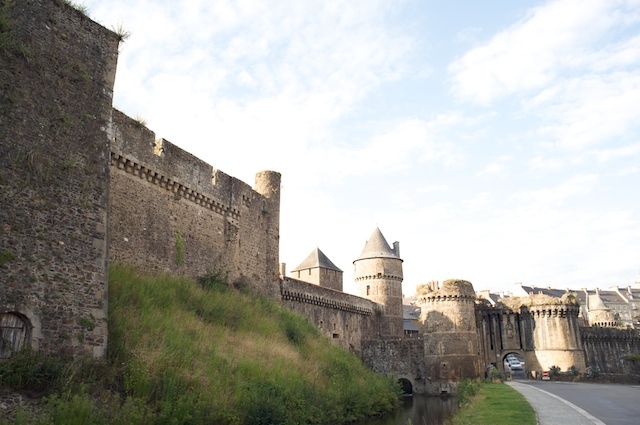 We visited the towns of Vitre, Josselin, and Vannes. 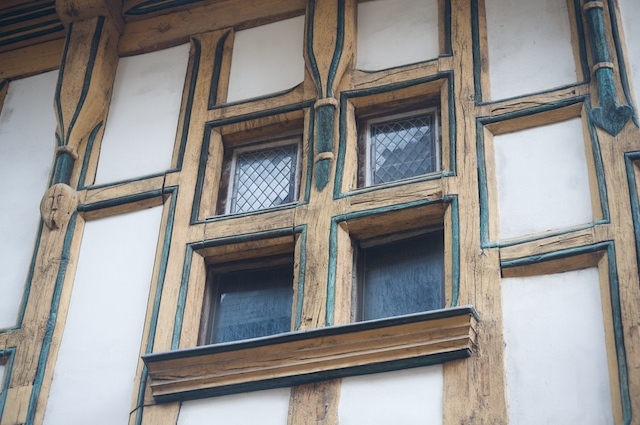 Each one had an old center, with lots of half-timbered buildings, on top of modern stores. 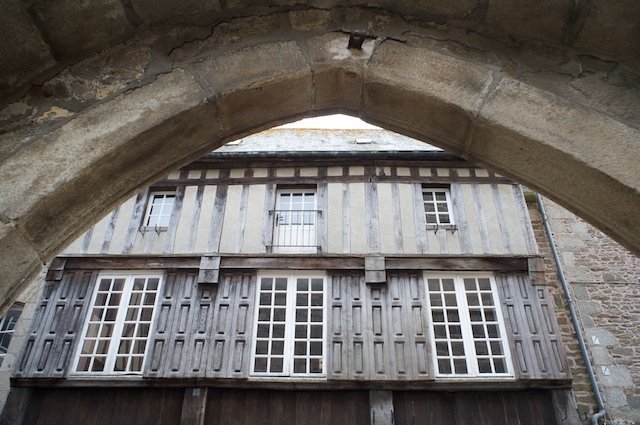 The rain got heavy in Josselin, while we were eating lunch at an outdoor cafe, but we were under a big awning so it was ok. Donnie took lots of pictures of the half-timbered buildings in the drizzle, but by then I was half-timbered-out. One thing that puzzled us is that these little towns were full of tourist-oriented shops, stores, cafes, bars, etc. but many of them were closed, most were empty and the streets were almost deserted. Donnie reminded me that the French take their vacations in August, and there is a well known saying that France is closed in August. This of course is an exaggeration. 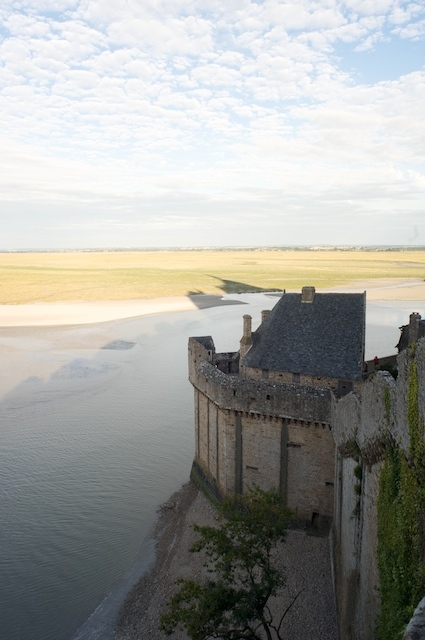 We knew where all the French people were: Mont St. Michel. We drove into Vannes and found the hotel that we had booked sight-unseen. Luckily, it was very nice, and the lady at the front desk, who spoke very understandable French, was friendly and helpful. The hotel decor was modern: new, bright, cheerful and pleasant, and this hotel and the previous one were inexpensive. We even were able to park in the hotel's private parking area which was in a gated courtyard behind the hotel. 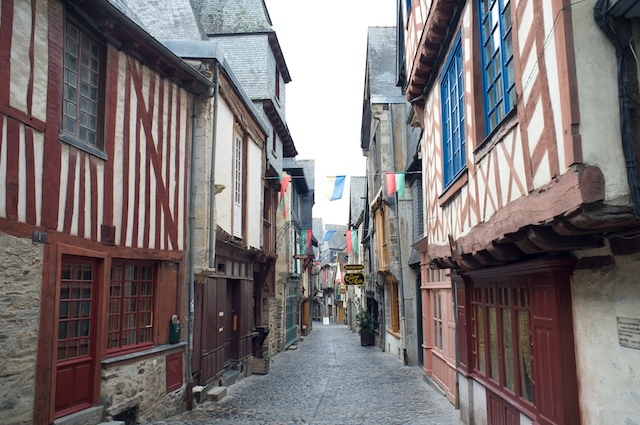 We found where the rest of the French tourists were; they were in Vannes. The old town and the port were crowded. 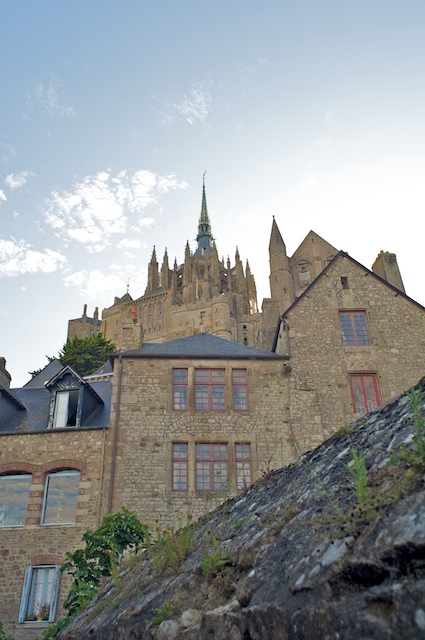 Not as crowded as Mont St. Michel, but the town was definitely bustling with lots of families and tourists. After we checked-in and dropped off our baggage, we walked to the center of the old town. It was full of twisty, winding streets of crooked half-timbered houses which led down to the port.